My emotional intention for this blog at the moment, is clearly unclear. I aim to make my internal motivation plain before the end of this composition. I will most likely take a rambling path but hopefully will arrive at some insight as I have no real direction to the destination. This is a searching moment for me. Let me see if I can narrow things down a bit for both of us. I want to write I need to write, I know that much. The external anatomy of my plan is to simply create space for myself to just write, write well, and write often. I need structure and accountability so I will label each day to remind myself of how many days into my journey I am. In the words of Lao-tzu “A journey of a thousand miles begins with a single step” and day one was my first. I have always considered myself a writer, actually I have not ever considered myself anything but a writer, in my heart of hearts. This I know to be my highest authenticity. I have never before followed this path because I let disapproval as a child discourage me. I let solitary despair rob me of my own voice. Criticism caused me to leave my sense of self back on the road in the swirling dust somewhere and I am disappointed it has taken some 30+ years to find myself again (mid-life crisis much?) I’ve lived a life following expectation instead of standing up for my desire, and fire, and dreams. When I was told I should be something other than what I was, I believed it. Every. Damn. Time. So I went under cover and never made it out alive, until now. Somewhere along the line I gave up on everything that was “me” but I am here now to kick resignation in the teeth, shake the shackles off my wrists, and reassert my soul. I always imagined it would feel this amazing to live my truth! I knew early on that I wasn’t a typical 10-year old young lady. I wasn’t interested in the same things other girls seemed to be interested in. It was difficult and divisive for me and I spent a lot of my time alone. I’ll never forget the time my mom signed me up for softball (*gasp*), I cried every time I had to leave the dugout (and so did my teammates.) The position I played was right field; you know, the one place that the coach hoped nothing would ever be hit to. I still remember a ball coming for me and I covered my head with my glove, turned my back, and crouched down with a shriek of terror. I knew I sucked at being good at things “normal” kids were good at. I had to pretend that playing Barbies and dress-up were thrilling to no end when all I really just wanted to do was dissect frogs in my room; to study them under the microscope I had begged Santa for years to bring me, or read a great novel, or write. I’m pretty sure my parents were worried about me. I remember most of all as a girl I would write poetry and short stories in my room late at night; the typical under-the-covers-with-a-flashlight-so-I-wouldn’t-get-caught kind. I loved to read the works of Robert Frost, Emily Dickinson, E.E. Cummings, Roald Dahl, Shel Silverstein, Laura Ingalls Wilder, Richard Adams, Paul Zindel, and many, many, many, more. My favorite work of all time is Mending Wall by Robert Frost. He doesn’t know it, but he taught me so much about imagery, euphony, cacophony, alliteration, symbolism and assonance. I can fully appreciate now, though I had no idea then, that this mouthful of unwieldy words developed a part of who I am through his work. I still strive for these qualities in my poetry. Never feeling like I fit in, or was good enough, or talented, has shaped me and carried through into my adult years. I didn’t really find peers that I could discuss my love of literature, art, and poetry with as a child and this holds true for me today. I still find distance between myself and most contemporaries in my immediate life. As a kid, I shut down the things that made me truly happy because I didn’t want anyone to think I was odd. I am now challenging myself to let that all go and follow passion. To be complete. To celebrate weirdness. For these reasons I have reached out across state and country boundaries for the inspiration and the camaraderie of other authors, poets, and artists. I have created this space to begin to express my true talent and love and joy and desire. My voice is slowly coming out of hiding and showing itself. I’m tired of dying inside damn it! Like my work if you do, don’t like it if you don’t, but life is too short for me to wait any longer. My voice will never again be secret. Comments and constructive criticism are always appreciated and I am really enjoying reading your blogs; we inspire one another! I am so excited to connect with a community of people who share my favorite things. 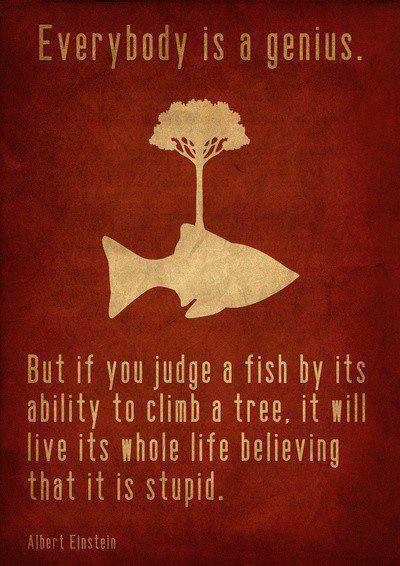 I think I will have Einstein’s quote tattooed onto my wrist. I guess we figured out why I am here eh? Peace. © Lauren Nalls, Clearing My Voice 2013. Unauthorized use and/or duplication of this material without express and written permission from this blog’s author and/or owner is strictly prohibited. Excerpts and links may be used, provided that full and clear credit is given to Lauren Nalls and Clearing My Voice with appropriate and specific direction to the original content. ...because life underwater is good! Igniting the imagination one line at a time.